I really love the look of candles. I love how they flicker and make everything soooo cozy. However, I rarely burn them these days. I guess the resistance stems back from when my son was young. A flickering flame was just a dangerous thing back then. 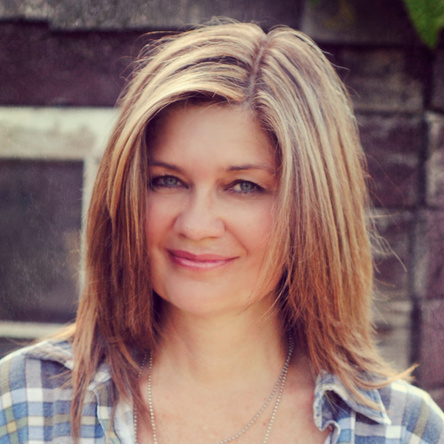 So… I set about creating the look without the worry, using my fav material… reclaimed wood. 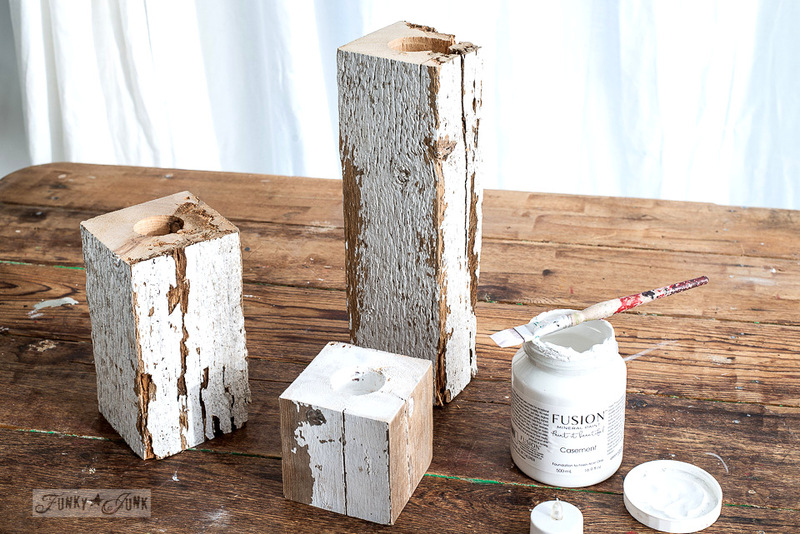 Faux candles are perfect for areas where you are OK to forget about them, such as an entry, bedroom or even bathroom. 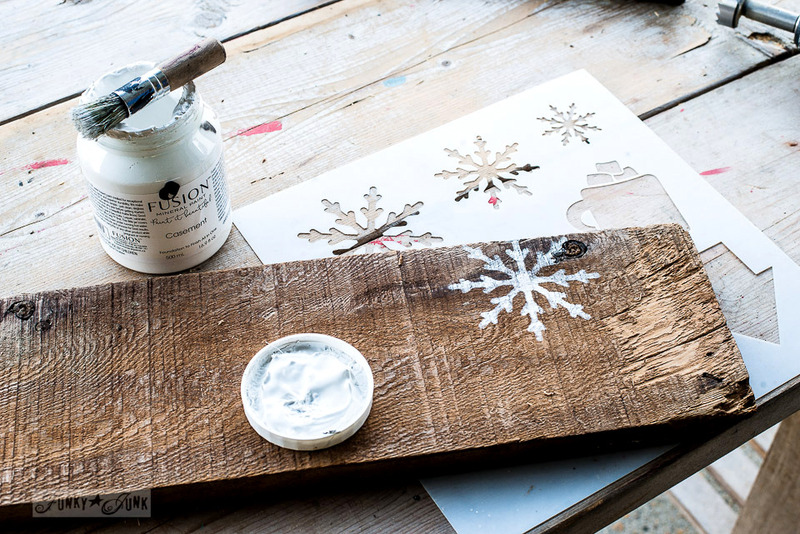 These rustic wood Christmas candles with a snowflake shelf are so fun and easy to make! And the sky’s the limit… you choose the kind of wood and look you want. 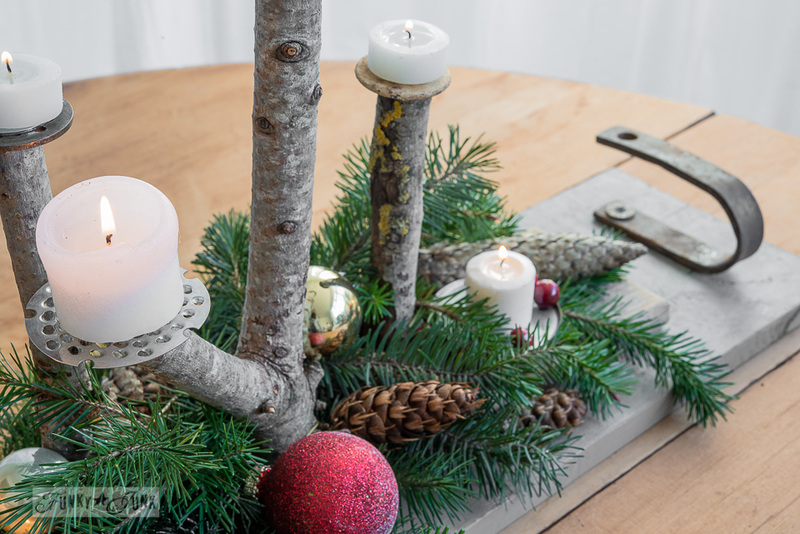 While these are not my own ‘invention’, these are my own twist… the more rustic, the better! 1. Cut chosen square posts to desired lengths. Remember my reclaimed wood snowmen? This wood is from the same square posts. 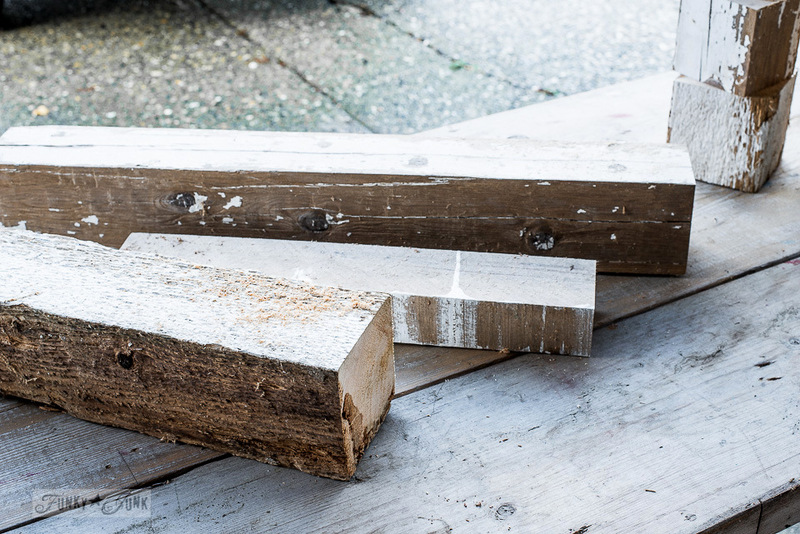 Any square shape will do, and you can of course pick brand new or reclaimed chippy wood. It’s all about what look you desire. 2. 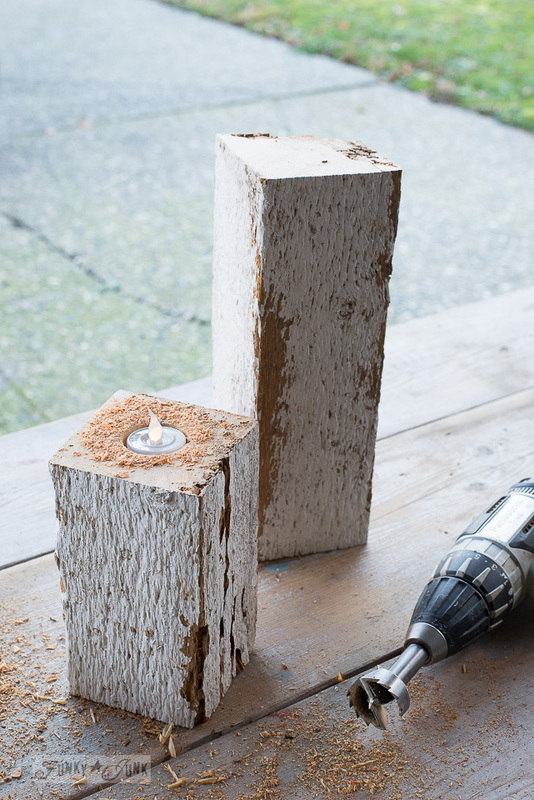 Drill holes into the tops of the posts to fit the chosen tealights, using a 1.5″ forstner bit. I had to laugh. I wanted this project however I needed to buy the drill bit to make it work. But… I’m sure I’ll be making these over and over in various ways so it’s just more ammunition for my tool arsenal, right?! So maybe just snoop through your stash to ensure you don’t already have something that may work. This was my first rodeo at using this bit. 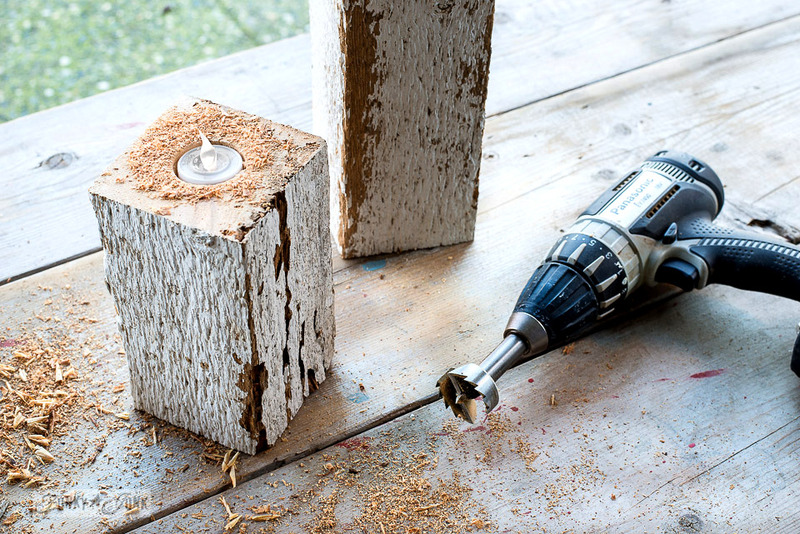 And I will say, it likes to grab hold of the wood unexpectedly at times while drilling. So it payed to go slow until the bit got a good grab of the wood, then I used slight pressure and gently rocked the bit, which helped enlarge the hole a little to ensure the 1.5″ candles would fit. 2. Paint the cut / drilled areas to hide the fresh cuts. I roughly touched up the cut tops and drilled holes with Fusion’s Casement so they would blend in moreso with the chippy sides. 3. Cut a plank of wood to desired length, stencil if desired, and attach two cupboard door handles on each end. I used Fusion’s Casement to stencil on random white snowflakes. To fancy up the candles, I tied various twine and rope around them, added some evergreen branches, and called it done! If I had faux snow, I would have added it to the tops of the candles to hide the fact that they are plastic votives. Above is a 2 minute video of the process so you can see how the drilling was done. I think they look cute on that compact tray! Or is the tray a large coaster for serving hot cocoa or coffee?! 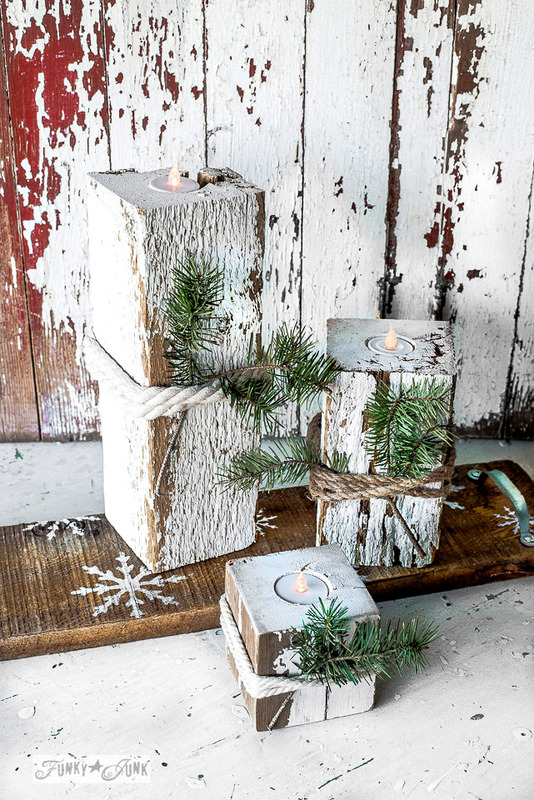 All I know is, I have some safe, cute rustic candles that have been moving all over my house! And the hardest part is where to leave them be… they seem to really like being everywhere. Think you’ll try some? How would you make yours? another beautiful, rustic, unusual creation!!! loving it as with previous candle projects. just too cool! I love what your creative mojo has been producing recently, very inspiring! Thanks Jo-Ann! I’m having a blast with my fav go-to wood! Hope it inspires you to make something cool too! So beautiful! One tip – they also sell tea lights that are on an automatic timer. Makes like so much easier! I did not know this, but now that I do? ON THE LIST! Thank-you! A great idea even though it was not your own. 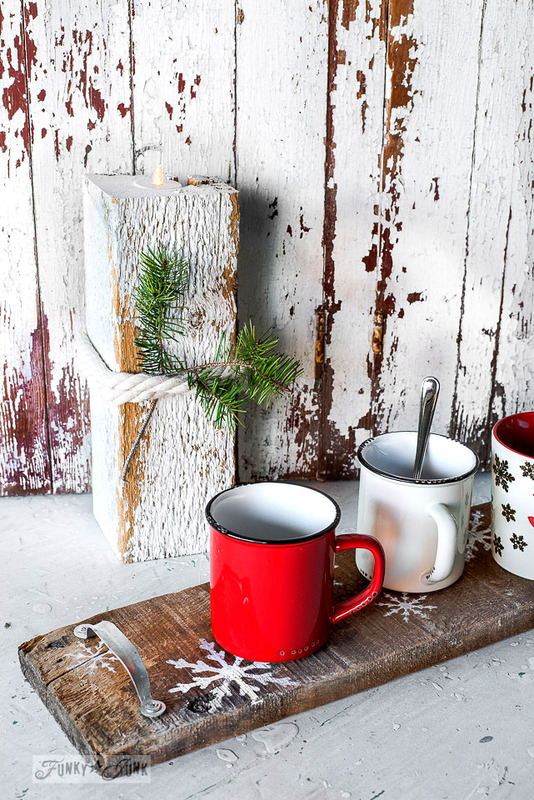 I love the snowflake tray and the several ways you show it used. 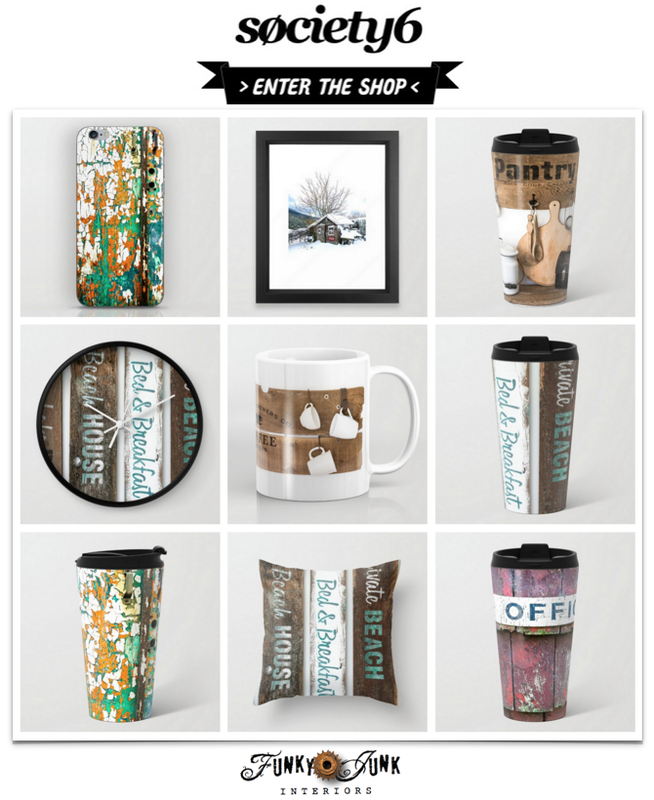 Mugs, candles and sure there are other ideas in your mind. Laura mentioned there are timer tea light candles. Had not seen those. Will be on the look out. Look forward to your next creation. 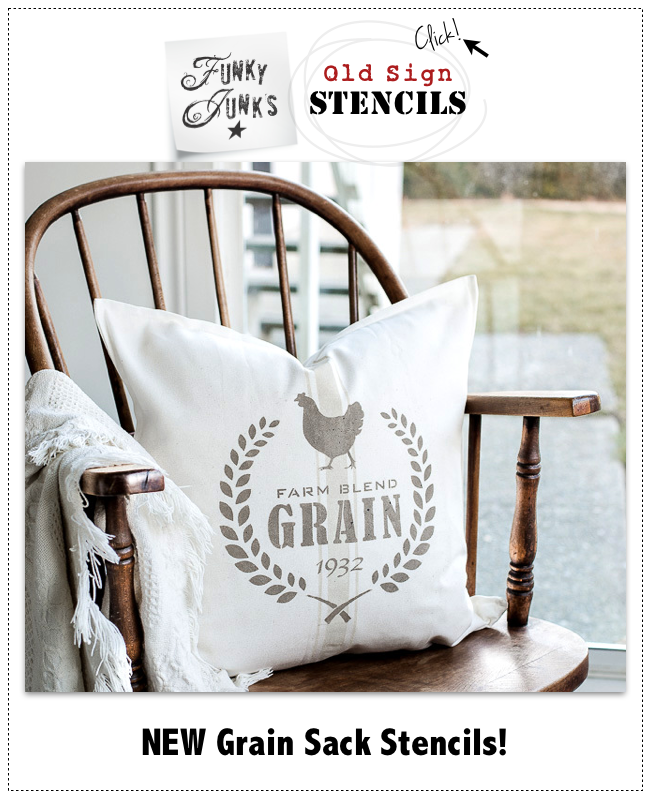 Oh and love the stenciled pillows in your post yesterday. You can bet the timer tealights are already on my list. AMAZING. And thank-you for the project kudos! I’m having a blast! Great, now I’m searching for chippy white posts to make candle holders, and ⛄️. Love your style! Haha yay! 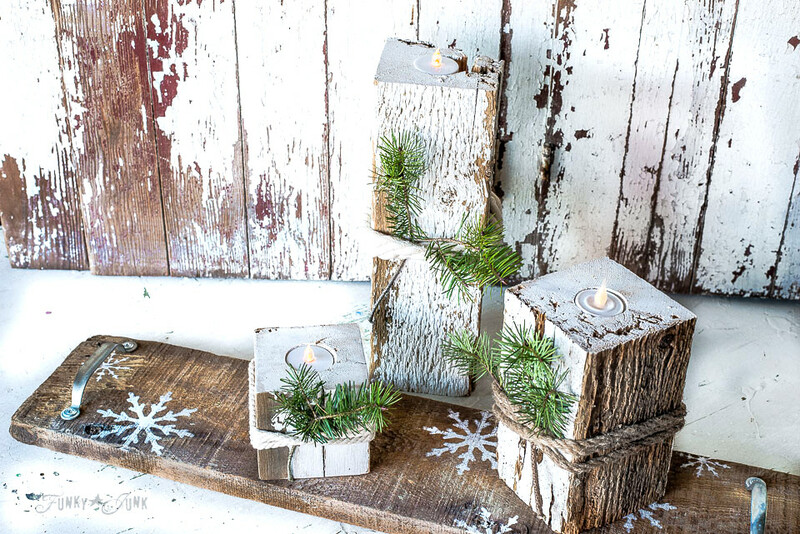 Bring on the rustic wood Christmas revolution! I hope you land some great wood! And thank-you for the kudos!